The emerging field of comics studies has grown rapidly in recent years. This has seen the publication of a number of introductory and theoretically engaged books aiming to provide comics and graphic novels with their own theoretical language, separate from the discourses of literary and film studies. 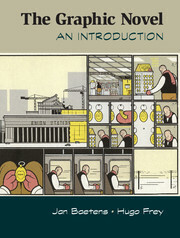 The Graphic Novel: An Introduction by Jan Baetens and Hugo Frey, is one such text. Published in 2015, Baetens and Frey’s The Graphic Novel: An Introduction is part of the ‘Cambridge Introductions’ series, and one of the first extended critical explorations of the graphic novel. The purpose of the book is, in simplified terms, to fully distinguish the graphic novel as an art form from comic books as popular entertainment, and to provide the tools and vocabulary to engage critically with this newer medium. Baetens and Frey argue that while graphic novels share many of the same features as comic books, they go beyond these origins: the graphic novel, ‘represents at least some level of self-knowing “play with a purpose” of the traditional comic book form, and in some cases a radical reformation of it.’ This sense of the graphic novel as pushing boundaries, experimenting with form and storytelling, allowing artists an individual style rather than imposing the “house style” of mainstream comic books production, gives the medium a creative legitimacy that Baetens and Frey would quite rightly see recognised. On a more practical level, the graphic novel is distinguished from the comic book in terms of its preference for more mature, adult content, moving away from the ‘juvenile’ superhero genre, and for the use of the book format over single issues and serialisation. The first section of this book deals with the historical context of comic books in America and the eventual formation of the graphic novel in the 1980s. Baetens and Frey provide a general overview of key developments and issues in the American comics industry, beginning with the moral panic of the 1950s that emerged in response to violent content and adult themes in certain comics–particularly in the horror and crime genres–which led to widespread censorship through the infamous Comics Code of 1954. In the narrative offered by Baetens and Frey, this censorship was a catalyst for change in the comics industry, encouraging a rebellion against conservatism, which fueled the underground comix of the 1960s. These provided the foundations for later graphic novels. Situating graphic novels within a narrative of rebellion and revolution, Baetens and Frey carefully manage one of the main issues with graphic novels: their implication in commercial strategies of cultural legitimisation. Graphic novels are often viewed as the construct of publishers wanting to reach a broader audience through repackaging comic books into a culturally acceptable form: the novel. In shifting the focus from graphic novels as a category to the graphic novel as a medium, Baetens and Frey manage to avoid this somewhat thorny issue in their history. In the second section of this book, Baetens and Frey discuss the basic formal aspects of the graphic novel and suggest ways in which these aspects can be approached from a critical perspective. This section focuses on page and panel composition, drawing style and the relationship between word and image, and the graphic novel as a specific form of storytelling. the ways in which readers make sense of graphic narrative (Charles Hatfield, Scott McCloud). In their discussion of forms, Baetens and Frey emphasise the sophistication of the grid in even its most basic and traditional expressions, and show the versatility with which it can be used. They suggest employing a method of close reading alongside an awareness of the overall dynamics of the reading process in order to fully appreciate the ways in which page and panel structure have been used in a particular text, and as a means of better understanding the text as a whole. Baetens and Frey introduce the concept of “graphiation” as a way of describing the personal style of the artist. This style can fall anywhere along a scale reaching from completely objective representation to full personal expression, depending on how visible the artist is within their own work. They go on to touch on some of the ideas that are thrown up by the possible convergence or divergence of the textual and visual elements of graphic narratives. They employ Roland Barthes’ idea of “anchorage/relay” from ‘Rhetoric of the Image’ to suggest that ‘graphic novelists work the other way around. Here it is not the meaning of the image that must be domesticated or completed by the use of words, but the meaning of the text that must be anchored or relayed.’ This is an interesting reframing of the relationship between image and text that clearly privileges the image as the main source of meaning, underlying truth, or intention in the graphic novel. As a not insignificant claim, this would benefit from greater use of examples than Baetens and Frey actually offer, and a more thorough discussion of its implications. Another key term introduced at this point is “grammatextuality,” which, in terms of the graphic novel, relates to ‘[t]he form of the lettering, the configuration of the words in the speech balloons and the insertions of these balloons in the panels, the presence of letters and other written symbols…’ Through different examples, Baetens and Frey show that in order to fully appreciate their depth and complexity, words in graphic novels not only need to be considered in terms of what they say but in terms of how they are visually manifested on the page. a story told in graphic novel format is more than just a story told in graphic novel format: the choice of the medium induces a set of possibilities as well as impossibilities, of obstacles as well as chances, that are not found in other media, even if it remains always possible to retell or remake a given story in a different medium. Considering the graphic novel as its own medium with its own distinctive methods of storytelling, Baetens and Frey make some interesting observations about the relationship between graphic novels and existing narratological research. They conclude that the graphic novel makes different demands on the field than other modes of storytelling, thereby offering the opportunity for interchange; a revitalisation of the field as well as its use. The distinguishing features of the comic book and graphic novel outlined by Baetens and Frey include, firstly, the narrative aspect of the drawing itself; drawing on Jarad Gardner’s “Storylines”, they explain how lines are used as ‘narrative agents and vehicles of storytelling.’ There is also an increased importance given to characterisation and spacialisation. The physical body and the environment that body occupies are the means through which the progression of time through space/setting is realised. This gives an increased sense of importance to place, with settings often becoming characters in their own right. Finally, the conflation of narration and description in comics, as opposed to mutual exclusivity of these modes in verbal storytelling, and the privileging of abstract forms and sequences and non-linear sequencing (as expressed by N. Katherine Hayles in her discussion of the ‘database’), distinguish comics and graphic novels from other media. Comics and graphic novels are distinguished specifically from film, as the medium often thought to be their closest relative, through their focus on illustration over narrative, and their multiperspectival representation of character. The shortest of the three sections, this does perhaps seem the least developed, particularly after a fairly comprehensive and well researched and structured section on form. It does, however, contain many interesting arguments and ideas. This final section deals with two of the main themes that Baetens and Frey identify in the graphic novel: the interplays between graphic novels and literary fiction, and nostalgia for historical content and historic comic book forms. They argue that literary culture has become increasingly open to visual narratives, and that this has led to many connections developing between the forms. They cite the ‘visually oriented public-commercial sphere’ as a driving force behind the increased engagement from traditional publishers and writers with visual and popular media, suggesting that, ‘traditional writers and publishers are far less secure in their cultural status and increasingly building bridges to the visual world.’ This suggestion takes a rather cynical view of the reasons for traditional literature “moving with times,” though it does prepare the ground for some interesting examples of contemporary works that blur the boundaries between high and low culture, and between traditional literary and visual or graphic narrative; among them, my favourite living Italian, Umberto Eco, and his illustrated novel The Mysterious Flame of Queen Loana. These examples are used in service of the position that ‘the literary world’s interest in comics and graphic novels further legitimates both fields as being part of the wider literary realm,’ nicely achieving the aims of the graphic novel genre; that it be seen as serious, literary, and comparable to the novel. Whether the goal of the graphic novel should be to be legitimised by the traditional novel is clearly an argument for another time, but something worth thinking about in the context offered here. The other side of this coin is the use of literature in graphic novels. Here, Baetens and Frey discuss literary adaptations, such as the infamous Classics Illustrated comics, and more modern graphic novel adaptations such as Heuet’s Proust. It is here that their main argument, that ‘there is a real difference between comics and graphic novel [sic] and [that] this difference is cultural rather than narrowly formal or visual’ comes home to rest. They explain how the reverential attitude towards literature seen in comic books such as Classics Illustrated is replaced by true literary adaptation in the graphic novel: ‘graphic novels are not afraid of taking liberties with the material they adapt.’ The literary experimentation of graphic novelists, and their explorations of the limits of their own medium differentiate them from comic book creators, placing them firmly in the sphere of the literary. Linked to the idea of literary adaptation is the idea that graphic novels play with and manipulate older comic forms in instances of ‘nostalgia’. This can take the form of republishing old classics, as well as upending familiar tropes. Baetens and Frey identify a fascination, even a preoccupation with the past in contemporary graphic novels of all genres, and perceive links to a wider nostalgia culture in contemporary society, situating the phenomenon as ‘part of ‘the digital era’s retro-mania.’ In spite of this, they maintain the idea of the graphic novel as a new and exciting reading experience, offering a break from traditional comics: ‘The content of some of the new graphic novels of the post-2000s is distinctive from the more typical nostalgia culture because these works have real political energy and bite.’ Using works by Kyle Baker and Art Spiegelman, they show that graphic novels are not limited to the simplistically nostalgic, but that they often engage with history in a critical and sophisticated way. The book concludes with a short bibliographical guide that discusses sources relevant to the various sections of their book. As a work aimed at students and scholars new to the field, this is a useful addition to aid further study. As a whole, The Graphic Novel: An Introduction is informative, and enjoyable. It introduces key concepts and ideas in a way that is easy to understand, and presents a solid and sustained central argument that is fully supported through well-discussed examples. A particular strength is the middle section on ‘Form’ which offers a number of strategies for achieving critical readings of graphic novels, illustrated by well-chosen examples, and supported by relevant theoretical models. Overall, this is a brilliant introduction to the graphic novel, and to comics studies more generally.